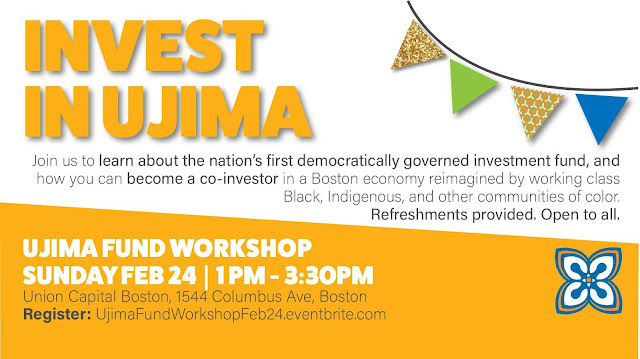 Join us to learn about the Boston Ujima Project's Ujima Fund and how you can become a co-investor! Refreshments provided. Free & open to all. Please email info@uijmaboston.com with any childcare needs. At this workshop, participants will learn about the Ujima ecosystem and democratic model, what it means to invest in Ujima, how to decide what size investment is right for you and how to actually invest. The rise of global authoritarianism, entrenched racial inequality, and ecological crisis are real threats to the future of our communities. But "Ujima," a celebrated Kwanzaa principle and Swahili for "collective work and responsibility," inspires us to confront these challenges with the power of cooperative action. Since 2015, the Ujima Project has engaged thousands of residents across Boston's working class communities of color to co-create a vision for a new economy. Ujima is modeling a "People's Economy" that is controlled and owned by all. At the heart of our alternative is the democratization of finance. We believe that everyday people, not bankers or politicians, should control our savings and wealth. To pilot this vision, Ujima's 450+ members made history last December by launching the first democratically governed investment fund in the US. Our goal is to raise $5 million from our families and allies to collectively invest in the needs and dreams of our communities. Rather than rely on the "invisible hand" to direct our capital, Ujima gathers our real hands of democracy to rewrite the rules of finance. Boston Chinese Investment Club & MIT Sloan Greater China Club will hold a forum on Commercial Real Estate Investment on Feb. 15th at MIT from 7:00 to 9:00 pm EST TIME, along with the grand opening of BCIC Commercial Real Estate Group. During this event, we are inviting critical players and experts in the field to unfold the latest trends as well as outlook of the 2019 US commercial real estate landscape. Specifically, the forum will cover the interpretation of different types of deals in the primary market, such as raw land development, flipping, mergers and acquisitions; secondary market of commercial real estate, including the analysis of REIT and risk management; the taxation issues of foreign capital investment in commercial real estate in the United States. Jeffrey Rosenberg has founded and operated businesses in the U.S. and Asia in the commodities, life sciences, consumer products, telecommunications and real estate industries. He started working and living in China in 1980. He built more than 100,000 square meters of mostly industrial and commercial space in China. In the mid-1990’s, he was a director of Tishman Speyer Properties responsible for real estate development in Asia Pacific. Most recently, he set up Dao Investments which partners with regional US real estate developers to develop mid-market residential properties in the Boston area. Three of Jeffrey's businesses have been written as Harvard Business School case studies, two about real estate and one about agri-business. Before, he built his investment and management experience in top financial institutions such as Millennium Management, Fidelity Investments, Putnam Investments, Scudder Kemp Investments and Fannie Mae, etc. Arthur R. Kerr concentrates his practice in international and domestic taxation, business law, contracts, and real estate. Arthur’s tax practice includes offshore and onshore planning and compliance for businesses and individuals, civil and criminal examinations and audits, collection matters, workouts, and tax controversies. He has extensive experience representing clients before the Internal Revenue Service and various state tax authorities. Welcome to the event, and feel free to extend the invitation to your colleagues and those who will benefit! (Please register your information in case we need to notify you for any changes). Time：Feb 15th, 7:00 p.m. - 9:00 p.m.
MIT Sloan Greater China Club (Sloan GCC) is a voluntary, non-profit organization with the mission to build a close-knit community for the growing number of Sloan students. We hold activities related to Greater China region in areas including professional development, social gathering and cross-cultural communication. 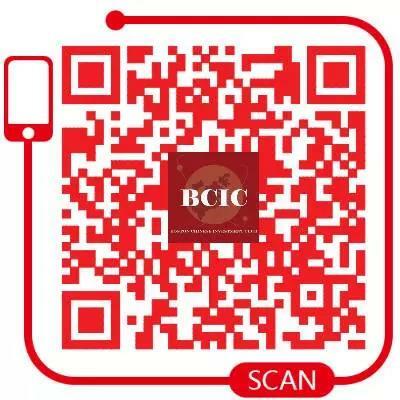 For future BCIC events, please visit us on the website at www.bcicglobal.org, or scan our Wechat QR Code at the bottom. Silvio Micali has been on the faculty at MIT, Electrical Engineering and Computer Science Department, since 1983. Silvio’s research interests are cryptography, zero knowledge, pseudorandom generation, secure protocols, and mechanism design. In 2017, Silvio founded Algorand, a fully decentralized, secure, and scalable blockchain which provides a common platform for building products and services for a decentralized economy. At Algorand, Silvio oversees all research, including theory, security and crypto finance.Silvio is the recipient of the Turing Award (in computer science), of the Goedel Prize (in theoretical computer science) and the RSA prize (in cryptography). He is a member of the National Academy of Sciences, the National Academy of Engineering, and the American Academy of Arts and Sciences. Henry Wang is the president of the SmartMesh Foundation, Co-chair of SmartRoots Fund, President of the International Federation of Blockchain applications (IBAF), and Founder of Universal Connectivity and Consensus Organization (UCCO). After receiving his master's degree in Physics from Peking University in 1999, Wang obtained a full scholarship for a Doctorate of Astronomy and Physics degree at Northwestern University in the United States. In 2000, Wang Qiheng transferred to Washington University in St. Louis to pursue a Doctoral degree in Computer Science. During his doctoral studies, Mr. Wang served as a core development member and director of business development for Erlang Technology in the United States. In 2006, Henry Wang left school and worked on several business, leading to the formation of the SmartMesh Foundation in Singapore, to realize his dream of the exchange of information and value without boundaries (Internet of Value). In April, 2018, Silicon valley IT magazine APAC CIO Outlook named SmartMesh among the world's top 10 blockchain technology solution providers for 2018. Henry Wang is a Thought Leader in the global Blockchain field and a world renowned technical expert. His research and development projects cover Internet Protocol, Blockchain, Chip design, Artificial Intelligence, Big Data, Edge Computing, Internet of Things, and Internet of Everything. Sarah Zhang is the founder of Points, the first truly scalable blockchain data collaboration protocol for better credit scoring and inclusive finance. Prior to Points, she was the ex-COO of Segway Robotics Inc., where she spearheaded the development of its developer community of more than 3000 participants including MIT, Intel and BMW. She was also formerly a Product Manager at Amazon. Her blockchain career began in 2013 when she was previously an early employee of Tim Draper’s accelerator, Draper University. In addition to founding Points, Sarah is the chair of dCamp, a Beijing-based blockchain developer and investor community. She is also a guest lecturer at Tsinghua University Blockchain Course. She received her MBA from Harvard Business School and her Masters in Public Policy from the Harvard Kennedy School of Government. Honggang Tang is the CIO of PlatON, Former Alibaba Investment Director, System Architect. Baidu Mobile Systems Department Architect. Motorola System Architect. Tsinghua Tongfang department manager. In Alibaba, he invested in artificial intelligence unicorn companies such as Sensetime and Cambricon. He also has 20 Chinese and US granted technical utility patents. Feng Han is the founder of MIT Blockchain Pillar and Foundation, Lecturer and instructor of Tsinghua University’s graduate course series ‘Cyber Smart Economics and Block Chain’, Secretary General of Asia Blockchain DACA (Distributed Autonomous Coalition of Asia) Association, Executive Council Member of Elastos, main author of ‘Blockchain Quantum Wealth’ and various other works. Jay Qin, CFA, is an Advisor to IDA Digital Asset Management. He is a vice president and senior investment manager at one of the world’s largest investment firms, serving some of the leading institutional clients globally. He has extensive institutional investment management experience in the areas of asset allocation, investment evaluation, risk management and portfolio construction. He is an early follower and practitioner in the blockchain industry. Victor Ji is the executive partner of BitBlock Capital, partner of Crypto Vision and Vice President of FIAT Capital. Chair of Harvard Kennedy School Blockchain and Cryptocurrency Club. Graduate student of MPAID program at Harvard Kennedy School. MBA X-plan from Guanghua School of Management at Peking University. Working experience in Israel, Denmark, Mckinsey and Fosun. Shuyao Kong (孔姝尧) is a member of ConsenSys’s Global Strategic Initiative team, with extensive business development, consulting and advisory experiences in regions such as Middle East, Northern Africa, as well as the Greater China. Shuyao started her career with IBM in New York, while pursuing a dual degree in Psychology & Economics at Smith College in Massachusetts. Shortly after working in NYC, Shuyao moved to Lagos, Nigeria, where she managed IBM’s Diversity program across Middle East & Africa and Turkey. In 2016, Shuyao moved to Dubai, working as a Strategy Consultant for IBM’s Global Business Services (GBS) unit where she helped regional banks design and implement digital banking solutions. She researched heavily on Fintech startups, which led her to the world of Blockchain. In 2017, Shuyao transitioned to ConsenSys where she was part of the team that expanded the Dubai, Saudi Arabia and later on Hong Kong as well as mainland China. Shuyao’s area of expertise resides in Blockchain advisory, digital solutions, UX/UI, and mobile development. John is the Managing Partner at SMC Capital. Formerly the CMO and CBDO at ICORating, the world’s leading blockchain rating agency. At ICORating, where he was responsible for marketing, business development and strategic partnerships. He and his team onboarded more than 50 investment funds, 10+ leading exchanges, and dozens of other strategic partners. Prior to his work at ICORating, He had his own consulting firm and was the CMO of a top-20 European travel company. He also work with leading media, such as Business Insider, Wall Street Journal, INC, Bitcoin.com and many others, as an expert. Tom Huang, is a co-founder of Hashgard, a well-known distributed and trusted digital asset protocol and platform for STO. The company raised 20 million dollars from 80 institutional funds via private sale and is the only one platform that has true mass adoption from 80 funds who will use it for the asset management. Dr. Zhao is the co-founder and CTO of CPChain. Dr. Zhao has more than 12 years research and develop experience on communication, Internet of Things and FinTech. Extended experience in management of R&D team. He has three patents on inventions in Internet of Things. Registered in Zug Switzerland, everiToken is world's first token-customized public chain aiming to be the best infrastructure to tokenize everything and for token economy. After a successful mainnet launch on 2018/07/31, everiToken has achieved high TPS(5,000+), high security and high standardization. EveriToken invents Safe Contract to replace the traditional smart contract layer of a typical public chain structure. Both traditional applications(Apps) and decentralized Apps(DApps) could use everiToken's core functions by calling token-related APIs. Please visit it everiToken.io for more information. IDA (International Digital Asset Management) is a global leader in asset digitalization. It provides an enterprise asset digitization solution and functionality to build thriving ecosystem for exchanging qualified real assets. IDA ranked 3rd in the 2018 National Mobile Internet Innovation Contest. It had successful application on digitalization of 3 Billion RMB timber asset from Laos’s virgin forest part of the Belt and Road Initiative. CPChain is a new distributed infrastructure for next generation IoT. CPChain intends to build a fundamental data platform for IoT system in combination with distributed storage, encryption computation and blockchain technologies, providing the whole process solution from data acquisition, storage, sharing to application.CPChain is a promising solution to a series of challenges of current “chimney architecture” of IoT systems, reducing connectivity cost of devices, protecting data privacy and maximizing the value of IoT data. By collecting, analyzing, utilizing spatial information, and researching Blochchain technology, Sky Exchange aim to realize skysharing by combining drones with blockchain technology. By realizing skysharing, all people will be able to use information and content related to the sky in close proximity to each other, thereby promoting the richness of everyday life and business efficiency. Boston Chinese Investment Club (BCIC) is a Boston registered non-profit organization founded by TCFA (The Chinese Finance Association) Boston organizers in 2010. It serves as Boston centered platform for exchanging ideas, knowledge, and information in finance/investment and related areas between US and China. Main activities include annual venture summits, monthly roundtable discussions, and roadshows. International Collegiate Blockchain Association (ICBA) foundation is based in America and has abundant resources and branch offices in regions such as China, Japan, and Vietnam where Blockchain Technology is developing rapidly. The foundation provides professional consulting and complete PR package tailored to specific market and regulatory environment in each region for Blockchain projects across the globe. BitBlock Group is a multinational blockchain investment, consulting and service corporation based in Beijing, Shanghai, Hangzhou and Boston. It is the holding company for BitBlock Capital, a token fund focusing on blockchain project and cryptocurrency investment, and BitWork Hub, an international consulting firm committed to serving blockchain projects. BitBlock Group has a solid foundation of intellectual capital and media resources, providing direct investments, professional services in the fields of business design, brand marketing, community operations, resource cooperation, technical services and regional roadshow. MIT Sloan Greater China Club (GCC) is a voluntary, non-profit organization with the mission to build a close-knit community for the growing number of Sloan students. We hold activities related to Greater China region in areas including professional development, social gathering and cross-cultural communication. We are excited to invite you and your team to join as part of our elite investor community. The conference is scheduled on Saturday, 11/1/7/2018 at the MIT Samberg Conference Center. The event will share with you with the latest thoughts and developments in Blockchain/Crypto domain from distinguished professionals and academia, and showcase some selected high quality Blockchain technology startups. BeeToken is building a middleman free, peer-to-peer network of hosts and guests on the decentralized web. It has the first decentralized home-sharing network, Beenest, built on top of Bee Protocols that connects hosts with guests without taking any commissions. DeepBrain Chain is a decentralized neural network. Countless nodes across the world will supply computational power to AI companies and receive DBC as rewards. 70% of the DBC will be paid by the system and AI companies only need to pay 30%.Our token, DBC, is traded via smart contracts based on NEO. We use a hybrid consensus mechanism combining DPOS with POI. DeepBrain Chain is also a secure data trading platform which, by separating data ownership from data usage, maximizes the value of data while ensuring data privacy. Zug Switzerland based everiToken is world's first token-customized public chain aiming to be the best infrastructure to tokenize everything and for token economy.Mainnet launched on 2018.07.31, everiToken has achieved high TPS(5,000+), high security and high standardization. IDA(International Digital Asset Management) is a global leader in asset digitalization. It provides an enterprise asset digitization solution and functionality to build thriving ecosystem for exchanging qualified real assets. IDA ranked 3rd in the 2018 National Mobile Internet Innovation Contest. It had successful application on digitalization of 3 Billion RMB timber asset from Laos’s virgin forest part of the Belt and Road Initiative. ScopeX is the world's first true AI blockchain. Scalability is provided by AI based state sharding, and our unique architecture of thin-Dapp clients and a fat-AI protocol allows for simplified application integrations. The ScopeX hash methodology uses on chain AI algorithms to distribute XAI in remittance to hardware and software suppliers, creating the next generation of decentralized infrastructure featuring self-regulation and the ability to evolve. VisionX is founded on the premise of touching as many lives as possible and putting a smile on someone’s face when they need it. Others: Incrypt, Hellofriend, VitaData, 3DEX, Points, Conflux, Coinweb, Venture Science, etc. Boston Chinese Investment Club (BCIC) is a Boston registered non-profit organization. It serves as Boston centered platform for exchanging ideas, knowledge, and information in finance/investment and related areas between US and China. Main activities include annual venture summits, monthly roundtable discussions, and roadshows. MIT Sloan Greater China Club (GCC) and Boston Chinese Investment Club (BCIC) will hold 2018 Fall BCIC Venture Summit in Boston, bringing venture capital funds and outstanding startups all together. The summit focuses on two sectors of cutting edge technology development: life science, and high-tech (including artificial intelligence, new material, microelectronics, etc.). We sincerely invite you to join us to this summit. Dr. Cai is a senior advisor for Northern Light Venture Capital, a leading venture capital firm for Healthcare, TMT, and Advanced Technologies. She is focused on early-stage investments in the US healthcare segment. Dr. Cai had over 20 years of experience in leadership positions with one of the world’s most respected biotech companies. As senior director of marketing in the Mass Spec. Division for Agilent Technologies, she was responsible for global thought leader collaboration and solution development for its billion-dollar MS business. Before that, as business development manager and product marketing manager, Dr. Cai was involved in multiple acquisitions and divestitures, and led a $500+ million-dollar flagship product development and its global commercialization. Ji-Xin Cheng was born in Jixi, Anhui Province, P. R. China in 1971. He attended University of Science and Technology of China (USTC) from 1989 to 1994. From 1994 to 1998, he carried out his Ph.D. study on bond-selective chemistry under the supervision of Qingshi Zhu at USTC. As a graduate student, he worked as a research assistant at Universite Paris-sud (France) on vibrational spectroscopy and the Hong Kong University of Science and Technology (HKUST) on quantum dynamics theory. After postdoctoral training on ultrafast spectroscopy in Yijing Yan’s group at HKUST, he joined Sunney Xie’s group at Harvard University as a postdoc, where he and others developed CARS microscopy that allows high-speed vibrational imaging of cells and tissues. Cheng joined Purdue University in 2003 as Assistant Professor in Weldon School of Biomedical Engineering and Department of Chemistry, promoted to Associate Professor in 2009 and Full Professor in 2013. He joined Boston University as the Moustakas Professor in Photonics and Optoelectronics in summer 2017. Professor Cheng and his research team have been at the most forefront of the constantly rising field of molecular spectroscopic imaging in technology, science, and clinical translation. Cheng is authored over 200 peer-reviewed articles with an h-index of 66 (Google Scholar). He organized/chaired 26 national/ international symposia, delivered over 200 invited talks. He holds 9 US patents for the invention of the CARS microscope and other technologies. He is the lead editor of the first book on coherent Raman scattering microscopy, CRC Press, 2012. In 2013 He co-founded Vibronix Inc which has the mission of saving lives through medical device innovations. Professor Cheng’s achievements have been recently recognized by Purdue University College of Engineering Research Excellence Award (2016), Craver Award from Coblentz Society (2015), Chang-Jiang Scholar from Chinese Minister of Education (2015), Fellow of American Institute of Medicine and Biological Engineering (2014), Purdue Univ. After receiving his PhD in Statistics and Bioinformatics from the North Carolina State University in 2004, Dr. Feng joined the faculty at the Washington University, and then the next year, the Duke University. His research interest focused on BIG DATA and machine-learning in precision medicine. In 2012, Dr. Feng moved to Boston, co-led a number of high-profile precision medicine projects in Biogen and AbbVie. In 2018, Dr. Feng started a company “Grace-Aging”, focusing on precision medicine solution for aging diseases, such as Osteoarthritis and Alzheimer’s disease. Xutian Jing (Ted), VP of Morningside Venture Capital, focuses in early-to-mid stage investment of healthcare companies, especially in medical services and biotech companies enabled by informational and/or computational technologies. He worked as a management consultant at IMS Health, now IQVIA, before joining Morningside VC. He holds a master degree at University of Pennsylvania and a bachelor degree at Nankai University. Mr. Qian entered Wall Street after receiving his Ph.D. of Mechanical and Aerospace Engineering from Princeton University. His 20-year investment finance career includes working as portfolio manager of convertible and high yield and private equity investment within CitiGroup, and world top hedge funds Fortress and Citadel. Afterwards he also held senior management positions as managing director in Lehman Brothers and Cowen. Mr. Qian recently has been advising China and overseas cross-border investment and M&A. He also guides overseas companies to develop business in China, including the United States and Israel companies setting up JV with local Chinese companies and expanding sales and product development in China. Dr. Jing Shan is a Principal Scientist in the group of biologics discovery and protein science at Moderna, a pioneering mRNA company that discovers and develops mRNA drugs to treat a variety of diseases. Dr. Jing Shan got her Bachelor of Medicine from Henan Medical School, China on 1996. She later got a Master in Science and Arts from University of Alberta, Canada in 2000, and a PhD from Columbia University, USA in 2010. She did her Postdoc on therapeutic monoclonal antibody discovery and development for oncology at Regeneron Pharmaceuticals, an industry leader in developing transgenic human immunoglobulin mouse platform for therapeutic human monoclonal antibody discovery. After her postdoc training, she continued working at Regeneron on many oncology programs, including antibodies that block oncogenic signaling pathways (Her family), inhibit tumor angiogenesis (Ang2 and DLL4), and enhance tumor-killing through antibody drug conjugate (PRLR-DM1) and bispecific antibody (CD20xCD3). She has also been involved in discovering and developing Regeneron’s immune-modulating antibodies, like PD1, CTLA4, and other hot immune-oncology targets that are in the forefront of current cancer immune therapy. In 2017 she got recruited to Moderna Therapeutics, a disruptive biotech that makes mRNA drugs. Such revolution approach uses cell’s software system – mRNA to make protein to treat all kinds of disorders, including infectious diseases, rare diseases and oncology. She is mainly responsible for discovering and developing new protein targets including antibody derived molecules as mRNA therapeutics. Dr. Jing Shan has published around 20 scientific papers, ranging from basic research to new antibody drug research and development for oncology. Yan Tan is the co-founder and CEO of Xbiome. He has worked for Fengrui Capital, focusing on cross-border investment in biotechnology and big data. He has participated in XtalPi, Vibronix, Conjur (acquired by CyberArk), Seven Bridges, etc. Early investment by cross-border technology companies, with rich experience in investment, financing and operation of cross-border technology projects. Prior to joining Fengrui Capital, Tamr, a big data company founded by the 2014 Turing Award winner Michael Stonebraker, was responsible for the design of big data integration solutions for biomedical companies and the company's international business. He previously served as co-chair of MIT-CHIEF 2015, the largest Chinese innovation and entrepreneurship organization in the East. Tan completed his Ph.D. in bioinformatics at the Broad Institute of MIT and Harvard and holds a bachelor's degree in biotechnology from Peking University. Howicle (Yi) Wang focus on investment in biomedical and healthcare. He co-founded Watson Capital, managed a fund of RMB 150 million, has invested in more than 10 projects. He used to work for ASB Ventures and has invested a number of outstanding companies in healthcare industry. He used to worked for Beijing Genomics Institutions (BGI), has experience on microbial product development, gene sequencing services and direct to consumer (DTC) genetic testing services. Chong is a Senior Associate at F-Prime Capital. He focuses primarily on biopharmaceutical and medical technology sectors and works closely with the Eight Roads Ventures Asia team to manage portfolio companies and new investment opportunities in China. Prior to joining F-Prime in 2015, Chong was an associate in McKinsey and Company’s Boston office, a hedge fund healthcare equity analyst with Massif Partners and Affirmed Healthcare, and a researcher focusing on developmental neurobiology at Temasek Life Sciences Laboratory in Singapore. Hanchen Huang chairs the Department of Mechanical and Industrial Engineering Department, Northeastern University. Hanchen Huang has been elected to the rank of Fellow of the American Association for the Advancement of Science, the American Society of Mechanical Engineers, and the Society of Engineering Science; as well as to the Connecticut Academy of Science and Engineering. In addition to his current role as the Department Chair, Hanchen Huang has served as the Chair of Executive Committee of the Center for Clean Energy Engineering at UCONN, the Director of Mechanical Engineering Program at RPI, and the Chair of University Faculty Senate's Honors and Awards Committee and a member of Advisory Council to the President (and that to the Provost) at RPI. Principal Engineer of DTonomy Inc.
Mr. Albert Ma is the Chief Innovation Officer of Insigma Hengtian Software, Ltd. He has over 25 years of IT management and software development experience. Before joining Hengtian, Mr. Ma was the Chief Information Officer of the State Street Technology Center for several years in Hangzhou, China. He was the core team member in setting up the IT operation locally and migration of strategic applications to the Hangzhou office. As the company’s Chief Innovation Officer, Mr. Ma manages the R&D and innovation activities of the company. He makes leading research efforts in technical solutions in Big Data Analytics, Cloud Computing, Mobile, Machine Learning and Software Engineering Automation. Hongyan (Steve) Sun is the Head of Yintech Financial Innovation Labs, Boston and Shanghai, of Yintech Investment Holdings (Nasdaq: YIN). He is taking charge of the research and development of innovative financial technologies in the areas of trading and investment utilizing artificial intelligence, cloud computing, big data analysis, and financial engineering. Prior to leading the research labs, he was the Director of Analytics of Cabot Research, a financial technology firm specializing in applied behavioral finance for investment institutions. In the past, he had chronically been the Director of Product Development of Kuberre Systems, a financial technology firm for investment, and a lead in quantitative analysis at RiverSource Investments, a senior software engineer at Lucent Technologies, and an engineer at the Institute of Physics, Chinese Academy of Sciences. He was granted a PhD in Physics and an MS in Computer Science, both from West Virginia University, a BS in Space Physics from Peking University. He has been active in a few of academic research areas and contributed significantly to researches in nonlinear dynamics and complexity. He actively participates in investment activities and is a CFA, FRM, CAIA, and CIPM. Lewis Wang is the Associate Director of Glory Ventures. He has abundant corporate management and industry consulting experience in TMT, Hi-end Manufacturing and Capital Market. Prior to joining Glory Ventures, He worked at China Insights Consultancy and was responsible for business financial service related to technical manufacturing and medical equipment industry, as well as consulting service related to IPO project. Lewis worked in ABB for over five years, and participated a wide range of projects, including product strategy in marine industry, business development in new energy industry, market entry research and market expansion plan. Lewis has profound understanding in automation industry and has the experience to lead the industry research and provide support to the corporate strategy for the management. He holds bachelor degree of Applied Physics from Southeast University and currently acts as entrepreneurship mentor for IDEA - Northeastern University's Venture Accelerator. She leads IBM's deep learning for healthcare (DL4HC) research and serves in the 2019 IBM Global Technology Outlook Committee, helping organizing cross-team collaboration and shaping next science and technology innovative strategies. Her research interests focus on developing machine learning and deep learning models to solve real world healthcare challenges. Particularly, she is interested in deep computational phenotyping, adverse drug reaction signal detection from heterogeneous real world evidence, causal inference from observational data, and translational informatics research (e.g., drug similarity for drug safety and discovery). The results of her research have been published in leading AI conferences including NIPS, ICLR, KDD, AAAI, IJCAI, SDM, ICDM, and top health informatics journals such as Nature Scientific Reports and JAMIA. She also serves as the principal investigator for several MIT-IBM joint projects. Prior to IBM Research, she acquired her Ph.D. degree from University of Washington, Seattle in 2016. Yuqian Xu is an assistant professor of Operations Management at the Gies College of Business, University of Illinois at Urbana-Champaign, and the R.C. Evans Analytics Fellow in the University of Illinois - Deloitte Foundation Center for Business Analytics. She serves as the Editorial Member of Probability in the Engineering and Informational Sciences. She has a B.S. in Statistics (2011) from the Kuang Yaming Honors School of Intensive Instruction in Science and Arts at Nanjing University, China. She receives her Ph.D. degree (Beta Gamma Sigma) in 2017 from NYU Stern School of Business with the Herman E. Krooss Dissertation Award. Li Yao is a partner at Tsing Ventures. She is also the deputy secretary of the Chinese Association of Fund of Funds. She was recently awarded Forbes Asia 30 under 30, and is the only Chinese female investor among laureates. The firms she invested in include, among others: Chasestone Capital, Zeapa Media and Coookie9. Tsing Ventures is a venture capital firm affiliated with China's prestigious Tsinghua University. Established in 2015, it now manages a total of $150 million. Yao holds Master’s degrees from both Tsinghua University and University of Oxford. She received her Bachelor’s degree from the Communication University of China. Dr. Trevor (Chuanwei) Zhuo is an engineer-turned-entrepreneur. Over the paste 11 years, he has been dedicated to materials innovation and their applications through both academia and industry. Building upon 16 peer-reviewed journal publications and three US patents, Trevor and his team had developed a sustainable solution for low cost carbon nanotube production while eliminating plastic and agriculture wastes. Such a solution is now under commercialization. He is now leading the business development and sales efforts in MesoGlue, LLC., offering room temperature metallic glue for industrial jointing/bonding applications. Trevor received his doctoral and masters degrees in Mechanical Engineering from Northeastern University in Boston, Massachusetts and his bachelor in Thermal Energy and Power Engineering from Harbin Institute of Technology, China. He is now pursuing his MBA degree in Entrepreneurship as the President’s Scholar in the F.W. Olin Graduate School at Babson College, the #1 program in Entrepreneurship education. MesoGlue, LLC develops technologies that utilize nanostructured metals. It has produced the first glue made of metal that sets at room temperature, and also provides solutions for catalysis and anti-microbial surfaces. China, an economic miracle for past decades, has developed the world’s second biggest financial market. MSCI’s decision to include China A shares in its global indices has attracted further attentions and capital flows. Meanwhile, Chinese investors are looking abroad for their asset allocation decisions. The China conference co-organized by the Boston Chinese Investment Club (BCIC) and CFA Society Boston will bring together thought leaders and finance practitioners from both China and the U.S. Through a panel discussion format, we will explore opportunities and challenges in investing in the Greater China region. · Constance Everson, CFA, Managing Director, Capital Markets Outlook Group, Inc.
· Kun Yang 杨坤, Director - PanAgora Asset Management, Inc.
· Zu Cowperthwaite, Senior Director, Emerging Markets -DePrince, Race & Zollo, Inc.
Receipts for reimbursement will be available upon request. CFA Society Boston is a founding society of CFA Institute, the global association of investment professionals that sets the standard for professional excellence and credentials. The organization is a champion for ethical behavior in investment markets and a respected source of knowledge in the global financial community. The end goal: to create an environment where investors’ interests come first, markets function at their best, and economies grow. CFA Institute has over 152,000 members in 163 countries and territories, including 145,000 CFA charterholders, and 148 member societies. Boston Chinese Investment Club (BCIC) is a non-profit organization founded by TCFA (The Chinese Finance Association) Boston organizers. It serves as Boston centered platform for exchanging ideas, knowledge, and information in finance and related areas between US and China. Main activities include monthly seminars/gatherings and providing services to members, e.g financial training. If you want to join the mailing list for future activities, please click here or send email to boston.chinese.investment.club@gmail.com. If you are interested in participating future road shows, please contact us in advance: start ups please send business plans to roadshow@bcicglobal.org; investors or sponsors, please contactinfo@bcicglobal.org. The Chinese Finance Association (TCFA) is a government registered non-profit organization aimed at facilitating the exchange of ideas, knowledge and information on education, research and practice in finance and related areas between the US and China. TCFA seeks to bring together the collective wisdom and expertise of scholars and professionals active in the field of finance in an effort to help the development of capital markets in China. TCFA further seeks to serve as the central venue to service its members in their professional development. In pursuit of these goals, TCFA and its local chapters organize and sponsor a broad range of activities including the best paper awards, career development workshops, seminars and annual conferences. TCFA Boson chapter has nearly 1000 members. Boston Chinese Investment Club (BCIC) Venture Capital Initiative launched in 2017 has helped at least three startups raising capital (USD and Yuan) successfully through our network, and assisted multiple teams in expanding their business into China market or finding China local partners. We has received positive feedbacks from all participating parties and proposals of cooperation from more institutions. The 2018 Fall US-China Venture Summit will be held in Boston this September 2018. The event, co-sponsored by MIT GCC, multiple venture capital funds from US and China, will focus on the cutting edge development in life science and technology (including artificial intelligence, new material, microelectronics, and etc. ), to help reconnecting between startups and investors. Please send your project profile and your company’s business plan to roadshow@bcicglobal.org by September 22, 2018. Boston Chinese Investment Club (BCIC) is a Boston registered non-profit organization founded by TCFA (The Chinese Finance Association) Boston organizers in 2010. It serves as Boston centered platform for exchanging ideas, knowledge, and information in finance/investment and related areas between US and China. Main activities include monthly seminars and roadshows. Join the BCIC mailing list to get our latest event information and job postings by registering for our events or send an email to boston.chinese.investment.club@gmail.com. Please feel free to contact us if you are interested in participating in future roadshows or monthly events. China, an economic miracle for past decades, has developed the world’s second-biggest financial market. MSCI’s decision to include China A shares in its global indices has attractedfurther attentions and capital flows. Meanwhile, Chinese investors are looking abroad for their asset allocation decisions. The China conference co-organized by the Boston Chinese Investment Club (BCIC) and CFA Society Boston will bring together thought leaders and finance practitioners from both China and the U.S.Through a panel discussion format, we will explore opportunities and challenges in investing in the Greater China region. Kun Yang 杨坤, Director - PanAgora Asset Management, Inc.
Zu Cowperthwaite, Portfolio Manager -DRZ Emerging Market Fund. CFA Society Boston is a founding society of CFA Institute, the global association of investment professionals that sets the standard for professional excellence and credentials. The organization is a champion for ethical behavior in investment markets and a respected source of knowledge in the global financial community. The end goal: to create an environment where investors interests come first, markets function at their best, and economies grow. CFA Institute has over 152,000 members in 163 countries and territories, including145,000 CFA charter holders, and 148 member societies. Boston Chinese Investment Club (BCIC) is a non-profit organization founded by TCFA (The Chinese Finance Association) Boston organizers. It serves as Boston centered platform for exchanging ideas, knowledge, and information in finance and related areas between US and China. Main activities include monthly seminars/gatherings and providing services to members, e.g financial training. If you want to join the mailing list for future activities, please send email to boston.chinese.investment.club@gmail.com. If you are interested in participating in future roadshows, please contact us in advance: startups please send business plans to roadshow@bcicglobal.org; investors or sponsors, please contact info@bcicglobal.org. The Chinese Finance Association (TCFA) is a government registered non-profit organization aimed at facilitating the exchange of ideas, knowledge, and information on education, research and practice in finance and related areas between the US and China. TCFA seeks to bring together the collective wisdom and expertise of scholars and professionals active in the field of finance in an effort to help the development of capital markets in China. TCFA further seeks to serve as the central venue to service its members in their professional development. In pursuit of these goals, TCFA and its local chapters organize and sponsor a broad range of activities including the best paper awards, career development workshops, seminars and annual conferences. TCFA Boson chapter has nearly 1000 members. MIT Sloan Greater China Club (Sloan GCC) is a voluntary, non-profit organization with the mission to build a close-knit community for the growing number of Sloan students. We hold activities related to the Greater China region in areas including professional development, social gathering, and cross-cultural communication. Headquartered in Shanghai Lujiazui, Wind Information is the leader in China’s financial services industry. We are committed to providing accurate and real-time information as well as sophisticated communication platforms for financial professionals. Founded in 1994, with over 3,000 employees, Wind Information has been the winner multiple times in Key Software Enterprise Accreditation within National Programming Layout, ShanghaiHigh-Tech Enterprises, Shanghai Technology Giant Enterprises, ShanghaiInnovative Service Industry Enterprises, and more.